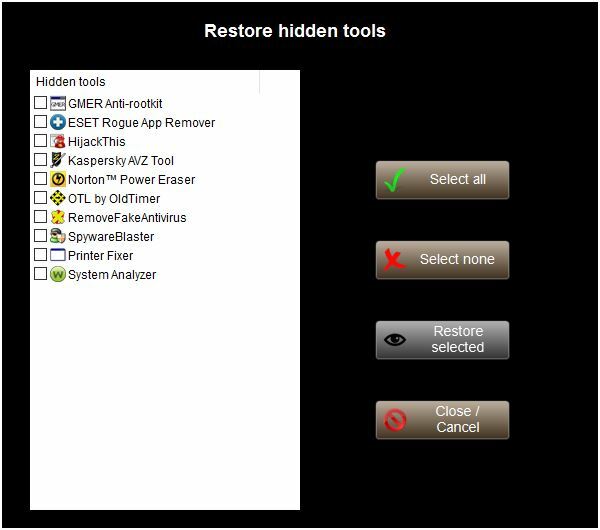 If you have previously hidden one or several tools, you can restore them by pressing Restore hidden tools, in the left pane. You will be presented with an overlay window showing the names of the hidden tool and a few options. Tick the check box next to the tools you wish to restore. The Select all and Select none buttons may help you to create the selection. Press Restore Selected to restore the visibility of the selected tools. Tech Toll Store will restore the tools and return to its normal interface. Or press Close / Cancel to cancel the operation. No hidden tools will be restored, in this case.